Eagles have fascinated humans for millennia. For some, the glimpse of a distant eagle instantly becomes a treasured lifelong memory. Others may never encounter a wild eagle in their lifetime. This book was written by people who have dedicated years to the study of eagles, to provide an insider's view for all readers, but especially those who have never been up close and personal with these magnifi… cent yet often misunderstood creatures.In their stories, twenty-nine leading eagle researchers share their remarkable field experiences, providing personal narratives that don't feature in their scientific publications. They tell of their fear at being stalked by grizzly bears, their surprise at being followed by the secret police, their embarrassment when accidentally firing mortar rockets over a school gymnasium, and their sense of awe at tracking eagles via satellite. The reader experiences the cultural shock of being guest of honor at a circumcision ceremony, the absurdity of sharing an aquatic car with the Khmer Rouge, and the sense of foreboding at being press-ganged into a frenzied tribal death march through the jungle. 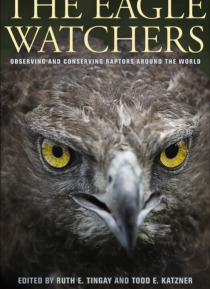 The Eagle Watchers covers twenty-four species on six continents, from well known (bald eagle; golden eagle), to obscure (black-and-chestnut eagle; New Guinea harpy eagle), and from common (African fish eagle) to critically endangered (Philippine eagle; Madagascar fish eagle). The diverse experiences vividly described in this book reveal the passion, dedication, and sense of adventure shared by those who study these majestic birds and strive for their conservation. Featuring stunning color photographs of the eagles, information on raptor conservation, a global list of all eagle species with ranges and conservation status, and a color map of the sites visited in the book, The Eagle Watchers will appeal to birders, conservationists, and adventure travelers alike. To further support the conservation programs described in this book, all royalties are being donated to two leading nonprofit organizations for raptor conservation training and fieldwork: Hawk Mountain Sanctuary Intern Program and the National Birds of Prey Trust.